[Washington, DC] (September 19, 2017) – Feld Entertainment, the worldwide leader in live family entertainment, announced today that tickets for Monster Jam B. are on sale now for Washington, DC. The new season will bring motorsport fans to the edge of their seats with adrenaline-charged, high-flying, four-wheel excitement that is fun for the entire family. Tickets start at $15 and are available by calling 800-745-3000 or online at www.ticketmaster.com. Unexpected, unscripted and unforgettable, Monster Jam takes center stage in the world’s most iconic venues like Capital One Arena , sporting meticulously manicured dirt tracks created with the sole purpose of pushing these perfectly engineered, larger-than-life trucks to the limit. 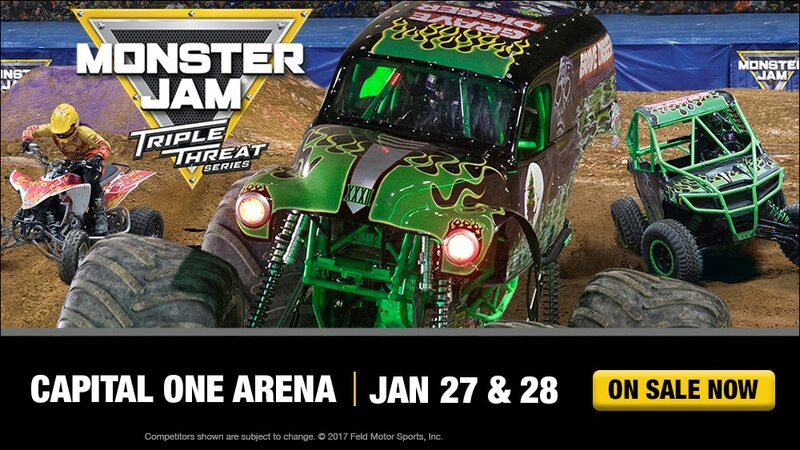 The Pit Party on Saturday, January 27 and Sunday, January 28 from 10:30 a.m. – 12:00 p.m gives fans the opportunity to get up close and personal to the Monster Jam trucks and drivers.